In honor of 49 years since Old City's liberation, 300 warriors march the streets of Jerusalem in a first for the festive day. A full 300 warriors of the Kfir brigade's Netzah Yehuda battalion, better known as the haredi battalion, conducted a massive march in Jerusalem on Sunday in honor of Jerusalem Day, marking 49 years since Israel liberated all of the capital. 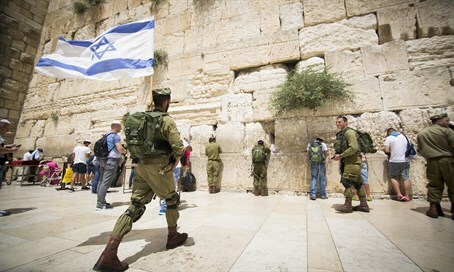 The soldiers marched along the major streets of Jerusalem towards the Kotel (Western Wall) to "reconquer" the Old City, in the first time IDF soldiers launched such a march in the capital on Jerusalem Day. A festive mood reigned as the soldiers began their march at Sacher Park, walking up Bezalel Street and down Ben Yehuda, along King George and on through Jaffa until they reached the Jaffa Gate of the Old City. From there they walked through the Jewish Quarter on to the Kotel. Numerous traffic routes were closed by police in order to allow the soldiers to perform their moving march through the city, singing as they went and raising the morale of the 3,000-year-old Jewish capital. All of the soldiers performed the march in full combat gear while carrying their automatic weapons. As they passed the offices of the Nahal Haredi Foundation and the Shiluv Menatzeah - IDF Haredi Alumni Association, which accompanies the soldiers during and after their military service, they met with the foundation's rabbis who marched alongside them. At the end of the march the soldiers reached the Kotel Plaza, where a ceremony was held attended by Netzah Yehuda battalion commander Lt. Col. Uri Levy and the battalion's rabbi, Cap. Rabbi Shaul Avdiel. Levy spoke to the soldiers, praising them and describing the power in the connection between their battalion, Jerusalem and the nation of Israel. Then Rabbi Avdiel spoke to them about Rabbi Yosef Haim Zonnefeld, who taught about the commandment to only see and take the best of Jerusalem and learn from that to be a better person. Rabbi Yaron David of the Nahal Haredi Foundation said that "the Netzah Yehuda battalion decided to hold the parade today of all days on the day of Jerusalem's celebrations." "Many Gedolim (leading rabbis - ed.) have considered this day to be a day of joy and festivities, among them, Rabbi Shlomo Zalman Oirbach, Rabbi Yosef Shalom Elyashiv and Rabbi Ovadia Yosef, ORM. This march was held in the spirit of the duty to be joyous, as expressed in their leadership."